30 g of quinoa per person. 1) Soak the quinoa in cold water for 30 minutes. 2) Drain. 3) Boil salted water which is the equivalent to twice the volume of quinoa. 4) Add the quinoa, cook on a low heat until it has absorbed the water, stirring occasionally. 5) Fry or grill the vegetables and leave them to marinate in a bowl with the spices for 4 hours. 6) Quickly fry the dates, pecans and cashews in a pan with a few drops of oil. 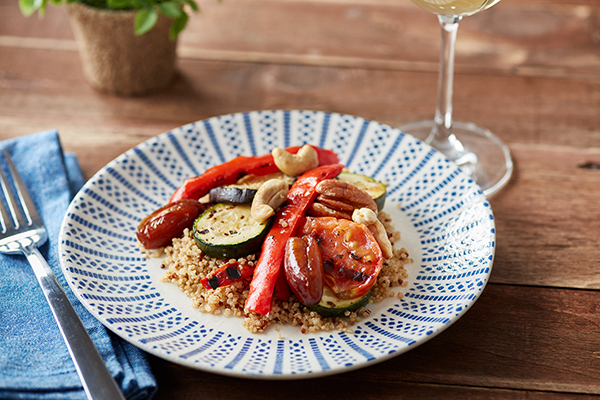 7) Plate the quinoa, topped with the vegetables, dates and cashews.